It's not that I disliked the demo they had on the show floor (though it had its issues), but my disappointment in Fable 2 stems entirely from what Lionhead chose to show us. It was the same build from this year's E3, featuring a short combat segment with the player character and their (player-controlled) henchman. 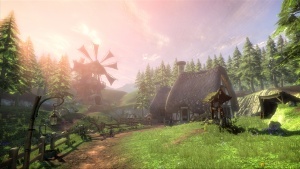 The combat in Fable was okay, but not a selling point; the character customization was what sold the game for many. I understand that it was a demo with a limited amount of time, but I still can't help but be bummed that I didn't get a chance to play around with different hairstyles, tattoos, etc (or even sneak a peek at the advancement system and available upgrades). What we saw was a glorified hack-and-slash that didn't have any of what I loved about the original Fable. That's not to say it won't be there in the final game, but it wasn't there at PAX. On the one hand, I can't help but feel like I'm criticizing the game unfairly because the kiosk I was playing it on was bugged, and abilities weren't being properly mapped to the 360 controller. I'm sure that if I got a chance to try it out again with a full repertoire of superhero-y moves at my disposal, it'd feel a lot more solid. That said, the game itself wasn't quite what I'd been expecting. I appreciate the comic-book feel that Cryptic is trying to emulate with the cel-shading, but the graphics do need a lot of polish. This is a game that I was hoping would be a clear cut above 2004's City of Heroes when it comes to visuals, and that simply wasn't the case. The combat was repetitive (though again, having a limited number of moves at my fingertips certainly didn't help), and even some of the cooler ideas felt clunky in the way they were implemented. I liked the idea of being able to pick up an object (say, a barrel) and hurl it at an enemy for an almost-instant KO, for instance, but there was an uncomfortable delay between when I pressed the button to pick it up and when my character actually hefted the barrel onto his shoulders. The game isn't set to release for a while, though, and many of these issues are ones that are certainly fixable before launch. Champions has some solid ideas (and I'm still loving the whole "create your own super-villain nemesis" aspect, to be sure), though it needs polish and fine-tuning - I'm not about to write this one off just yet.